Controlling your own wedding can be an easy affair if planned strategically. 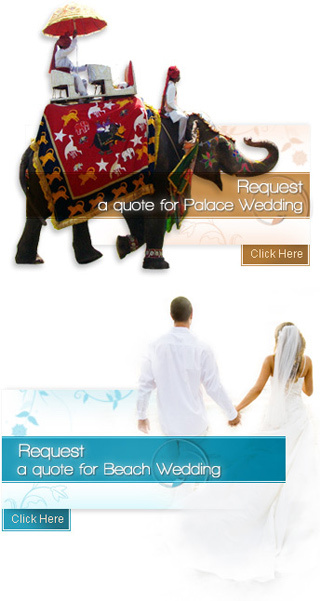 All that you require is an excellent wedding planning coupled with optimum use of resources. Weddings in India are expensive affairs but with adequate planning you can check your resources from going into the drain. Each and every ritual of the wedding has its own significance and requires resources for its performance. You must plan well in order to get best results in least budget. Controlling you own wedding in India is not a very difficult task. All that it is needed is good wedding planning. A wedding ceremony can be an expensive affair and so, planning your wedding budget is very essential. Today, in the modern world, there are wedding planners who can do the planning for you. You just have to discuss your wedding budget with him and the wedding theme and your wedding would be planned. Rituals and customs should also be considered for controlling your own wedding. There are various pre-wedding functions that need to be looked into for controlling your own wedding. The 'Mehndi' ceremony and the engagement function need individual planning. You should look into the accessories that are required for both the bride and the groom and shopping is also better when done in a personalized manner. There are a number of things to consider while shopping, like buying things according to the wedding theme and the attires that would match the traditional theme. If you opt for controlling your own wedding, and not depend on the wedding planners, then wedding decoration would be an important aspect to really focus on. The main day function needs a lot of planned work, where you should work according to your wedding theme. Opt for simple wedding theme like decorating the wedding 'mandap' with flowers or just craft work. Wedding reception also needs similar attention. Decorating the reception hall and planning the arrangement and dining should be done in a flawless manner. There are modern trends in the market that can aptlly match your wedding theme and the accessories for the couple. The audio systems and the photography have caught up with the modern and one shouldn't miss the capturing of these once in a lifetime moments. Controlling your own wedding can be made easy if the planning and management go hand in hand.